U.S. stocks posted modest gains on Friday, resulting in a sixth weekly advance. The bulk of equity gains came on Wednesday, following President Trump’s well-received Tuesday evening address to a joint session of Congress. While announcing plans to invest $1 trillion in infrastructure spending over 10-years, the president’s spending plans were short on details, but his speech marked a calmer, more presidential tone, full of optimism and pleas for cross-party cooperation. The Dow Industrials jumped 303 points on Wednesday, finishing above 21,000 for the first time, taking just 24 trading days since reaching 20,000 on January 25th. For the week, including some profit-taking on Thursday, the S&P 500 climbed by +0.71%, the Dow Industrials gained +0.88%, and the MSCI EAFE (developed international) rose +0.45%. As shown in Chart 1 above, the Eurozone’s preliminary February all-industry composite activity Purchasing Managers Index (PMI) from IHS Markit jumped to a near six-year (70 month) high of 56.0, suggesting the pace of the growth across the European Union improved markedly. Indeed, the increase was broad-based across countries and components. According to J.P. Morgan, the PMI reading would be consistent with about 2.5% annualized GDP growth. The firm is cautious about placing significant weight on one month’s reading, but the increase was large enough (and supported by national surveys) to prompt an upward revision to their first-half 2017 growth outlook. Their revised forecast has growth at 2.25% in the first quarter and 2% expected for the second quarter. Furthermore, average GDP growth in the euro-region of 1.8% has delivered a 0.8% average annual decline in the unemployment rate in recent years. Absent a revival of productivity growth, the unemployment rate could fall even faster in 2017. This would pressure the European Central Bank (ECB), given that the unemployment rate of 9.6% is not far from the ECB’s 8.5% full employment target estimate. 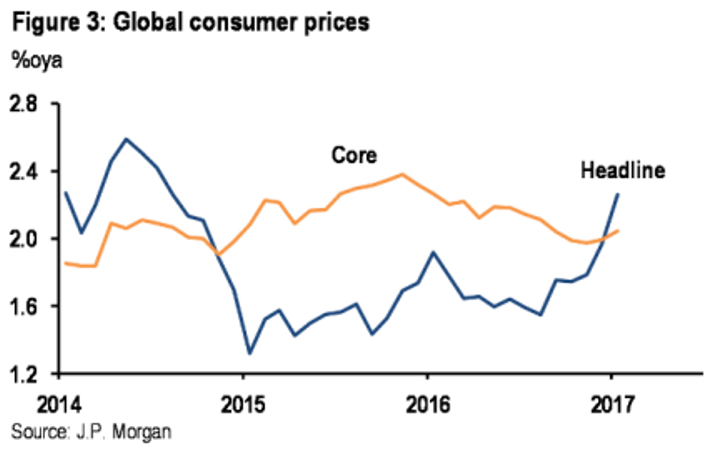 These macro considerations have driven J.P. Morgan to forecast an ECB tapering in their bond-buying program at the start of next year (2018) and a rate hike in second-half of 2018.